from 1887-1937. Today the depot houses the Chatham Railroad Museum, including relics from the era, a 75-year-old caboose from the New York Central system, and a diorama of the Chatham train yards of 1915. National Register of Historic Places. 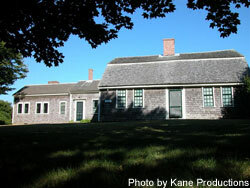 The museum is manned by an experienced group of volunteers from all over Cape Cod. 19th-century architect Henry Hobson Richardson, the Eldredge Public Library an architectural jewel, was completed in 1896. National Register of Historic Places. The Chatham Marconi Maritime Center welcomes visitors to its Marconi-RCA Wireless Museum and Education Center located at 847 Orleans Road (Route 28), overlooking Ryder’s Cove and the Atlantic in the Chathamport area of North Chatham. Built for Guglielmo Marconi in 1914, the 11.3-acre, 10-building campus of distinctive structures has been preserved by the Town of Chatham and is on the National Register of Historic Places. Marconi’s Wireless Receiving Station was initially part of his visionary global network planned to link America with Europe and Japan. Six craftsman style houses today serve as private residences. The former Power House and an attached garage serve as storage facilities for the town. And the former Operations and Residence Hotel buildings serve respectively as CMMC’s museum and Education Center. Through exhibits and videos, the unique Marconi-RCA Wireless Museum preserves the story of Chatham’s role in wireless communication beginning with Marconi’s life and legacy. Subsequently under the Radio Corporation of America (RCA) and known by the call letters WCC, it was the busiest ship-to-shore station on the East Coast during most of the 20th century. Not only did WCC relay vital messages to ships around the world, it also provided communications to brave aviators and bold adventurers – Charles and Anne Lindberg, Amelia Earhart and Howard Hughes. During World War II, the U.S. Navy operated the Chatham station as secret “Station C” whose mission it was to intercept coded messages from enemy surface vessels and submarines, helping to win the Battle of the Atlantic. Permanent exhibits include videos about Marconi’s life and the role of WCC in world events, the authentic working shipboard radio from the hospital ship Hope, artifacts from important periods in WCC’s history, and an opportunity for visitors to practice Morse code as well as to experiment with the Enigma code of WWII. There is an outdoor Antenna Field Trail exhibit which visitors are invited to explore during daylight hours. The Education Center facility has a state-of-art education room, as well as space for current technology exhibits and public events. www.chathammarconi.org. Constructed in 1924, the school housed all twelve grades until 1963. It finally closed in 1998 and is now being restored. This major project focuses on preserving and enhancing the historical character of this town landmark, while creating a new Community Center featuring meeting and recreational space, a gymnasium and a teen center.